Both Masculine and understated, this cobalt chrome ring is simple enough for every wear but special enough to stand out from the crowd. Cobalt chrome alloy is highly biocompatible so this ring is hypoallergenic and you don't have to worry about reacting to it. 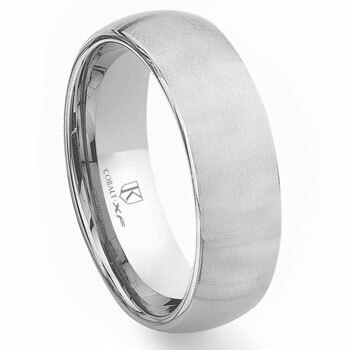 The premium white gold color is permanent unlike platinum or silver jewelry. It is also much stronger in terms of tensile strength so that it will always stay perfectly around and never band out of shape. This ring is also offered with a high polish finish. Click on the following links for matching bands in various band widths 4MM, 6MM, 7MM.